Guaranty Bancshares Inc., the parent company of Guaranty Bank & Trust, N.A., announced today that its Board of Directors has adopted a stock repurchase program. Under the repurchase program, Guaranty may repurchase up to 500,000 shares of its company’s common stock, or approximately 4 percent of the outstanding shares. The repurchase program permits shares to be acquired from time to time in the open market or negotiated transactions at prices management considers to be attractive and in the best interest of both Guaranty and its shareholders, subject to compliance with applicable laws and regulations, general market and economic conditions, the financial and regulatory condition of Guaranty, liquidity needs, and other factors. 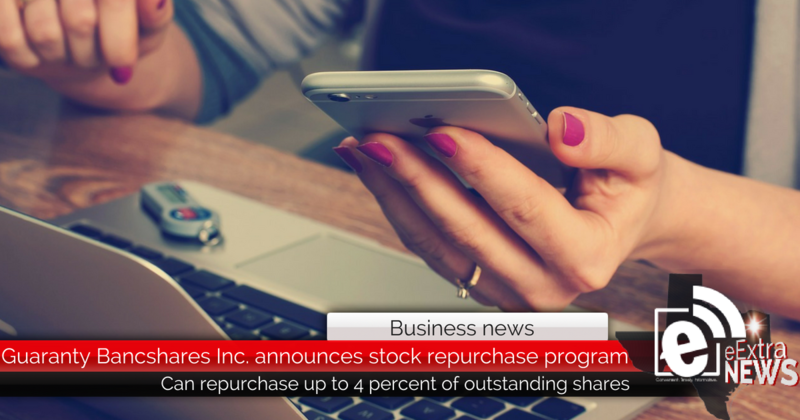 This stock repurchase program does not obligate Guaranty to repurchase any specific number of shares and may be modified, suspended or discontinued at any time at the discretion of the board. Guaranty expects to fund any repurchases with cash on hand or future cash flow. As of May 31, 2018, Guaranty had 11,060,956 shares outstanding, and Guaranty issued an additional 900,000 shares of common stock as a portion of the consideration for its acquisition of Westbound Bank, which closed on June 1, 2018.